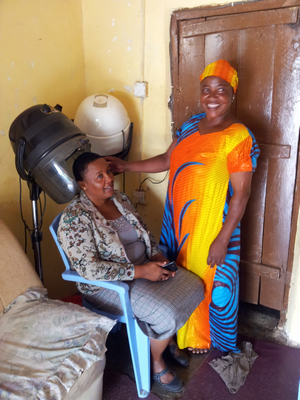 Judith launched her salon a year ago with a Mondo grant. She recently took out a loan to buy an additional hairdryer and has almost paid this back. Whilst basic, her salon is well placed on a street corner in the busy township of Msaranga. She is building a regular clientele and feels confident that the business will grow. Her eldest daughter, Rosalind, helps in the salon part time in the evenings and at weekends. Apart from the salon, Judith has a clothing business and sells door to door on weekly credit. In fact, Judith is wearing one of her daughter’s creations in the picture! Judith is very positive about the future and hopes her Rosalind will take over the business if she ever becomes too sick to continue work. If you would like to help support more women like Judith, we are currently raising funds for our next round of grants and loans. To help us achieve our target you can donate here.